Happy Saturday afternoon, folks! I hope you are all enjoying the weekend. I’ve had a grand day: enjoying a leisurely breakfast with my honey followed by shopping for groceries (yes, I am one of those odd people that actually loves to grocery shop), baking my favorite oatmeal cookies, and as I’m writing this, I have two loaves of French Bread rising in the kitchen. It must be the sunshine and glorious spring weather that has me so inspired. On top of all that, I get to share one of my most recent altered projects with you: my ABC Primer Altered Printer’s Tray. 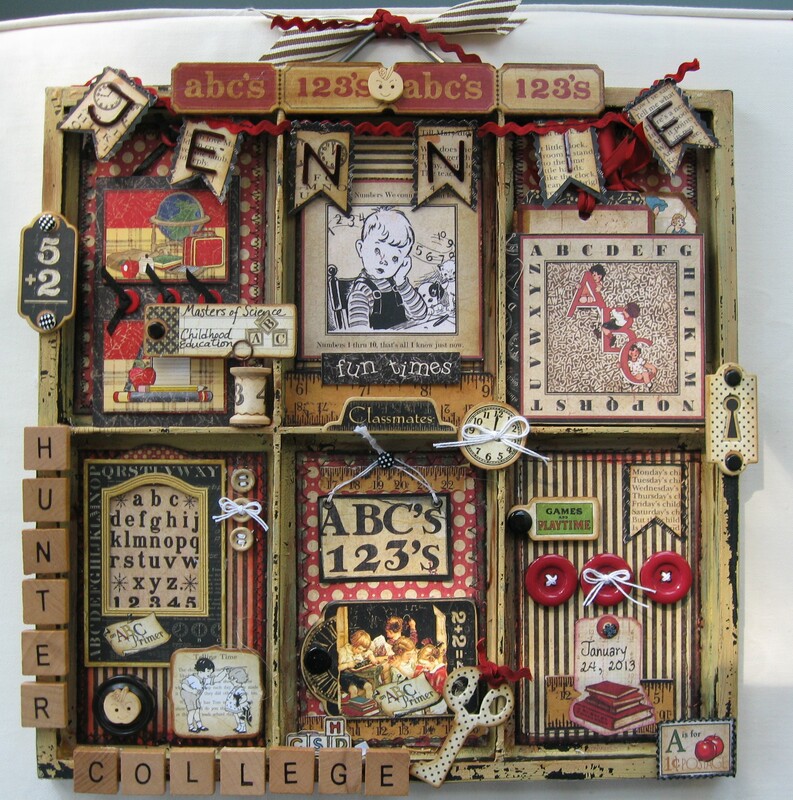 My friend Sally asked me if I could alter a 7 Gypsies Printer tray as a gift for a recent college graduate. She wanted the tray painted and aged. After giving the printer’s tray a very light sanding, I painted it with Ranger Distress Crackle Paint in Antique Linen. Once the paint had dried to a delightfully shabby crackled finish, I rubbed a scrubbing sponge over parts of the surface to reveal more of the original brown foundation. 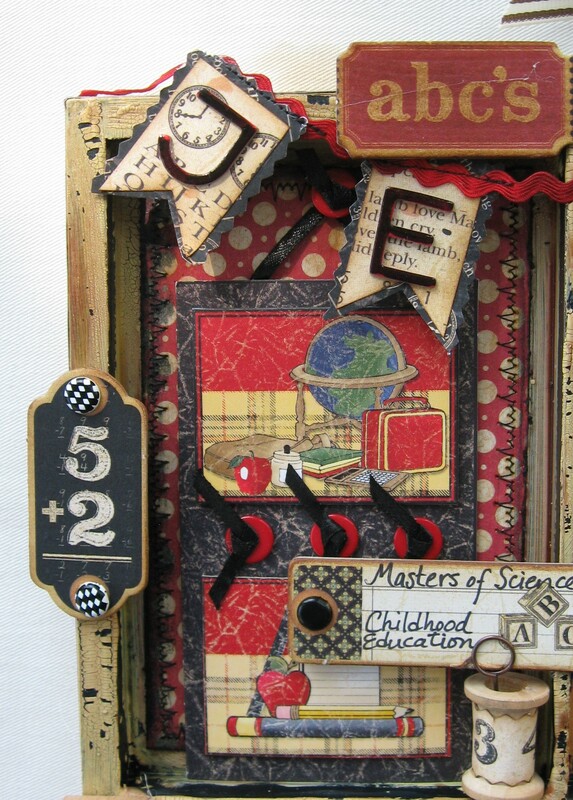 I also hit it with some Vintage Photo Distress Ink, and then sealed the whole thing with Studio Matte Multi Medium. I was thrilled with how well this worked. If you click on the photo, you’ll be able to see the distressed finish more closely. This is the top tier of the tray, featuring a banner with the graduate’s name. Since Jennie received her Masters of Science in Childhood Eduation, using Graphic 45 ABC Primer was a natural choice for altering this tray. 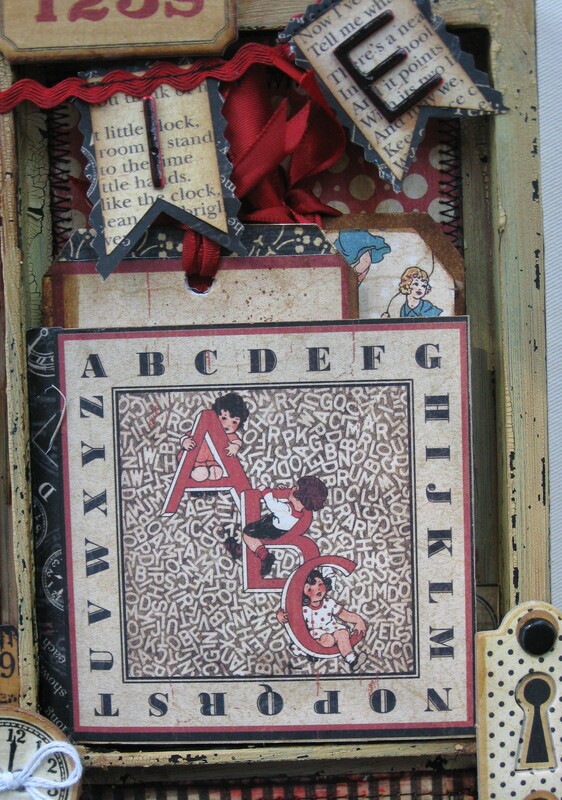 Here’s a closeup of the first opening in this ABC Primer Altered Printer’s Tray. 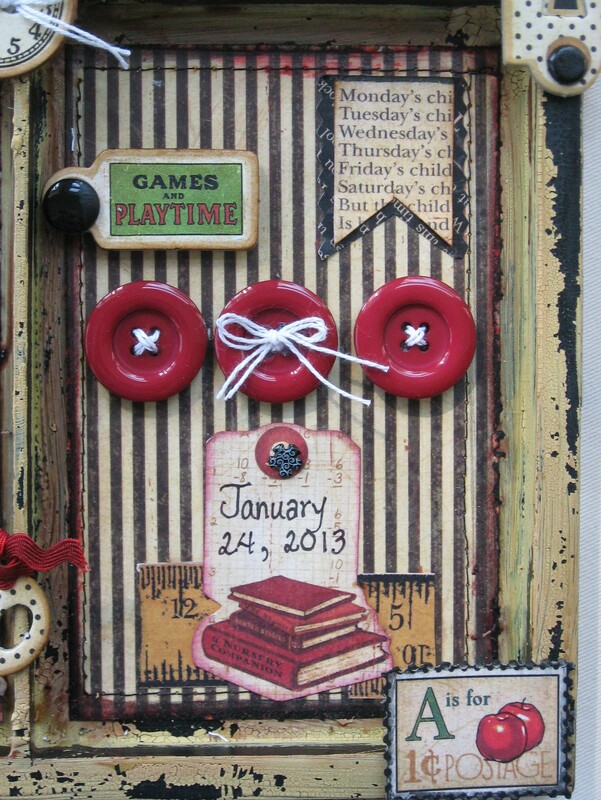 I’ve added fun chipboard embellishments and a vintage wooden spool to decorate. The primary colors look great with the antique linen distress paint. 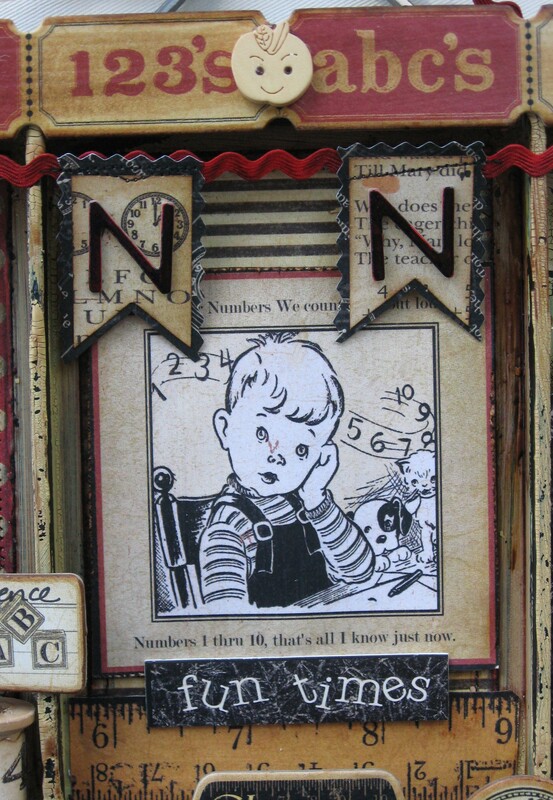 The second panel features this sweet little boy and a snippet of that fabulous yellow ruler from the cut apart page of the collection. I used two patterns to back the panels: the fun red dot, and the cream and black stripe. 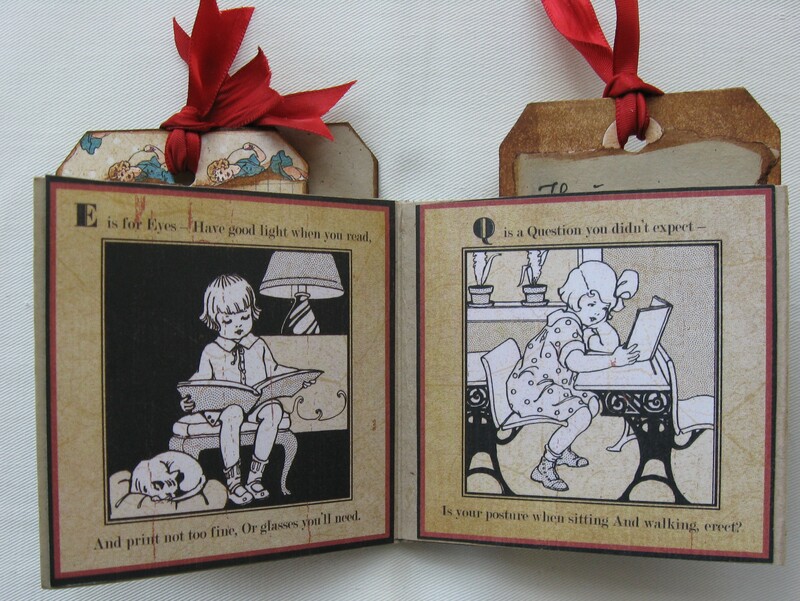 I stitched around the perimeter of each panel, distressed the edges and inked them with Vintage Photo Ink. The smaller images were matted on black paper after inking the edges. Page one, with a book plate from the ABC Primer collection. The pocket is at the top. 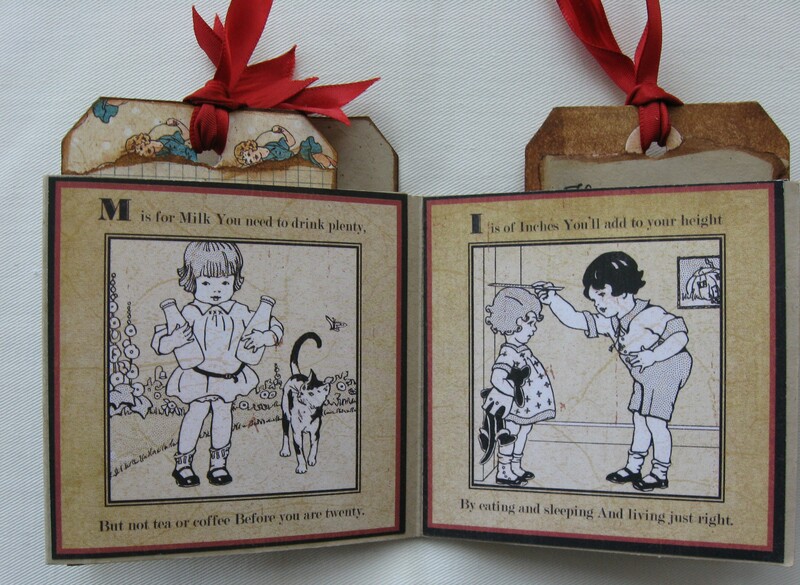 Page 2: I love these sweet vintage images of children. They are so innocent and pure. Page 3. Don’t you love the sayings written on each page? They come from actual elementary primers from days gone by. 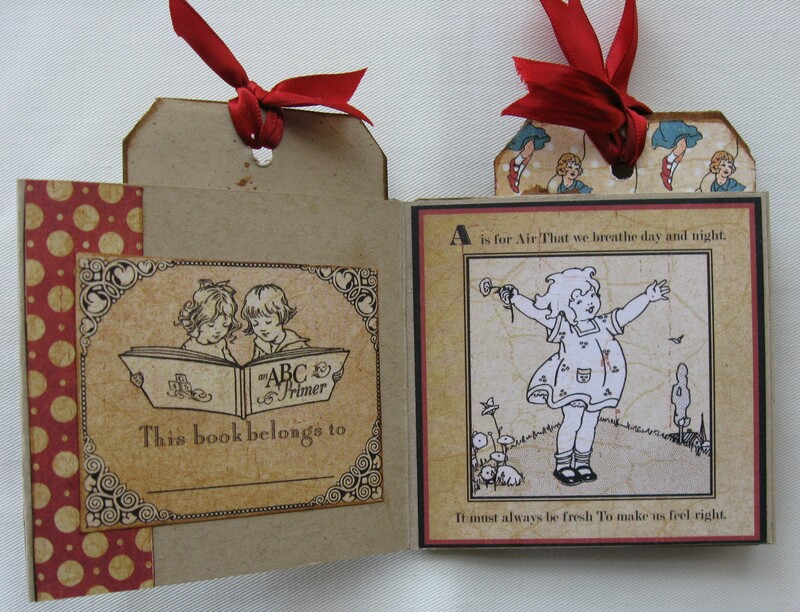 And here are the tags that are tucked inside the mini book. 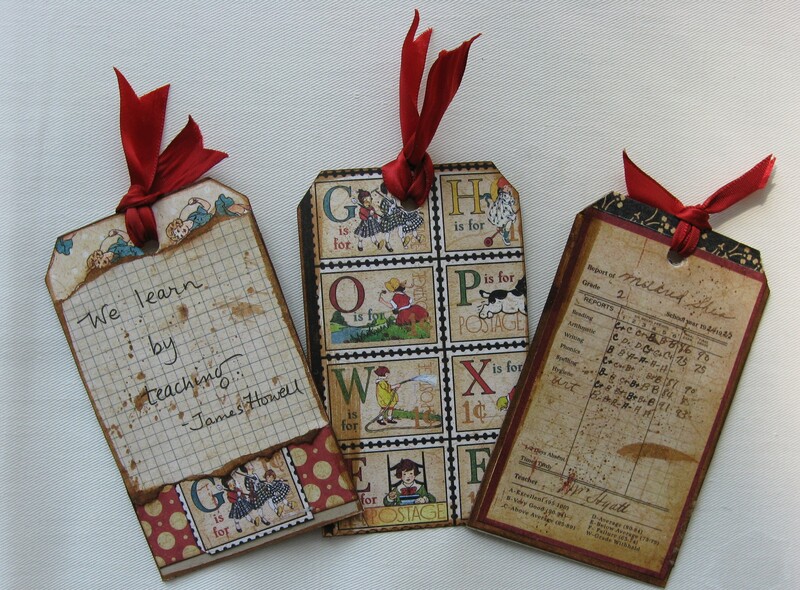 Each tag has room to add a photo on one side, and an inspirational quote about education on the other. I left one tag blank so that Sally could write a personal note. 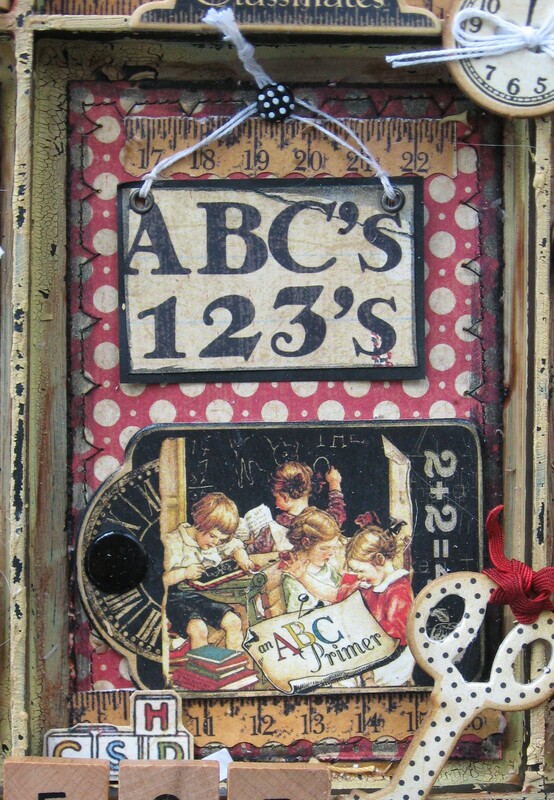 I used a chipboard frame from the collection to create a wall hanging inside the panel. 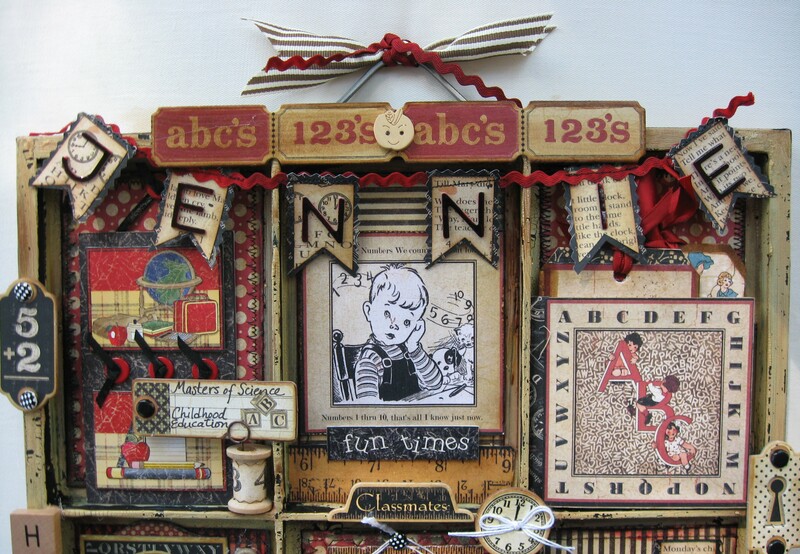 Vintage buttons and twine add just the right touch. I used a little piece of paper, matted it on black and created this faux blackboard to hang above the classroom scene. Oh, and each panel was sealed with Matte Multi Medium, just to protect it from dust and moisture. The final panel contains the date of the graduation ceremony, more vintage buttons and a fishtail flag.Look at that yummy distressing! Remember: you can click on the photos for a better view of the details. 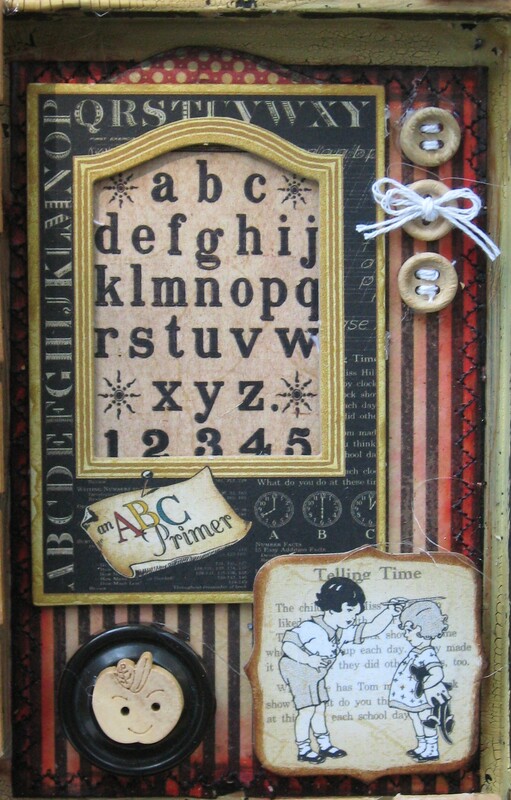 Products used in this project: 7 Gypsy’s Prnter Tray; Graphic 45 ABC Primer paper collection and chipboard; Ranger Distress Crackle Paint in Antique Linen; Ranger Distress Ink in Vintage Photo; HOTP School Almost Done Pages; Buttons and Spool from my stash. This entry was posted in Uncategorized on April 20, 2013 by kathycNC. Totally beautiful, Kathy! Love what you’ve done with those G45 papers. I absolutely love it! Make sure you link it to the G45 FB page and load it to the Ning site! What a treasure! I predict the graduate will cherish this for many years to come!